1024 p. (various pagings) : illus., maps (part col.) ; 28 cm. 88-609, 88th Congress, as amended. technology will be available for canal construction. justify acceptance of a substantial financial risk. confidence as it draws nearer. sea-level canal on Route 10 as are then deemed appropriate. STRUCTION AND OPERATION .................................. .
for its management, which go back to 1903. Panama Canal we know has served the past and the present." 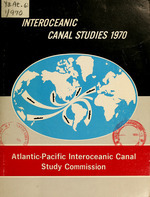 The Commission has been guided in its investigation by numerous earlier canal studies. The 1947 study conducted by the Governor of the Panama Canal. The 1960 study by the House Committee on Merchant Marine and Fisheries. The 1960 and 1964 studies by the Panama Canal Company. enabled the Commission to concentrate its efforts on the most promising ones. United States for United States-Panama Relations. provides for multinational participation in canal finance or management. 1967 of what might have been acceptable to their respective Governments at that time. a sea-level canal in Panama. review prior studies and to develop a new canal study plan for presentation to the Congress. -10o00, 8 COSTA SEE INSERT "A"
adequate for evaluations of Routes 8 and 14. Study of Foreign Policy Considerations. Study of National Defense Aspects. Study of Interoceanic and Intercoastal Shipping. (subsequently combined with the Study of Foreign Policy Considerations). the conduct of the Study of Engineering Feasibility. capacities and construction, operation, and maintenance costs. route nearby, one that did not interfere with the existing canal, might be preferable. to provide for excavation of approximately 20 miles of its length by conventional methods. agreed to include in its final report an analysis of it based upon available data. contained in Annex V, Study of Engineering Feasibility. world commerce and contribute significantly to the national security of the United States. Company the Congress set it at a minimum to lessen the interest burden on toll revenues. Company to be $700 million, excluding defense costs. tolls for the purpose of amortizing its debts. Since 1951 the Congress has continued to confirm its intent to maintain low tolls. and to keep it open in any circumstances, peace or war. bound for Vietnam passes through the canal. cannot be quickly augmented to compensate for canal closure. objections to the planning and execution of hemisphere defense activities from Zone bases. with defense of the surrounding area at great distances from the canal itself. given the United States the right to construct a canal in the Province of Panama. territory and all the rights as if sovereign in the Canal Zone. interoceanic canal across Nicaraguan territory. fundamentally change the 1903 Treaty relationship. opening date of a sea-level canal, but no later than 2009, if one were built. negotiated when the United States decided to execute its option. been extended for the duration of the treaty for the new canal. That Panama eventually become sole owner and operator of the canal. goal the reconciliation of the interests of both countries in a lasting agreement. living in an enclave extending across the middle of the Republic of Panama. politically sensitive elements in the current situation. The economy of Colombia is larger and more broadly based than that of Panama. 23 traversing the territories of both Panama and Colombia. United States relations with Nicaragua and Costa Rica have traditionally been friendly. Route 8, generally along the border between Nicaragua and Costa Rica. economies are vitally linked with the canal. will continue to provide an adequate interoceanic passage. contained in the United Nations Statistical Yearbook, 1970.
traffic and revenues described herein of necessity incorporate assumptions and judgments. the total tonnages passing through the canal. the present canal was independently developed by Economic Research Associates, Inc.
passed through the locks, estimated to be 26,800 per year. oTs LT IL U . COMPARISON OF PREVIOUS PANAMA CANAL TRAFFIC FORECASTS AND "
year are carried through the Panama Canal. amount of commercial cargo in the future, as variously estimated, are shown in Table 3. Panama Canal. This table relates to commercial ocean traffic only. 300 million long tons per year. Litton forecast of world trade, would justify high expectations for a sea-level canal. century and unrealistic levels thereafter. Canal traffic in recent years stemmed from trade with Japan, as shown in Table 5.
from construction of a sea-level canal. Isthmian canal, considering a range of maximum size ships to be accommodated. would be 13,000 DWT; dry bulker, 51,600 DWT; and tanker, 55,000 DWT. excluding the weight of the ship itself. into the lower portion in later years. of tonnages continuing to transit in freighters through the forecast period. transits. The revenue from tankers is higher because of their higher ratio of ballast transits. bulky, light cargoes and are often not fully laden. between such traffic and the average toll is shown in Table 9.
toll credits of non-commercial transits. take place over the long run with loss of much of the potential traffic. per cent to 150 per cent. produced by continuation of the present system. Panama Canal toll structure to realize the maximum potential revenues in an Isthmian canal. legislatively established obligations of the Panama Canal Company. potential of a sea-level canal. e. Substitute sources and markets. above present Panama Canal tolls. potential traffic from alternative routes and transportation modes. canal with a capacity to transit ships of 200,000 DWT or larger. alternatives with little impact on the volume of traffic. the variations in tolls sensitivities among commodities, ship sizes, and routes. alternatives offers the greatest revenue potential for a sea-level canal. appeared to meet the requirements of the embryonic technology. develop a practical nuclear excavation technology. crater about 1200 feet in diameter and about 320 feet deep with a volume of about 6.5 million cubic yards. and rock. Row crater experiments had been conducted with chemical explosives only. could be held to insignificant levels. *Nuclear explosive equivalent of one million tons of the chemical explosive, trinitrotoluene (TNT). points to a pick-up truck. minimum necessary to develop the technology. tested rock, saturated rock, and clay sales as found on the Isthmian routes. required for the Isthmian canal excavation, however, remain to be carried out. significant ground motion were made to estimate structural response and damage. scientists of different fields (marine, terrestrial, agriculture, forest, freshwater, etc.). and stream flow were measured. People were counted. for a number of findings not previously possible. aspects of these routes are contained in Chapter VII, Analysis of Alternatives. it is unlikely that multiple-row techniques can be developed to produce flatter slopes. portion of Route 17 would require conventional excavation. in number of explosives and in total yield required. significant reduction in the size of the area affected is possible. tidal checks would reach 6.5 knots in the conventional section. nuclear excavation, but is well suited for economical hydraulic dredging. believes these estimates, like those for Route 17, could be reduced. inhabitants would have to be evacuated to permit nuclear operations on Route 25.
construction that would be planned to begin within the next ten years. yield explosions is too indefinite for assured design and the "enhancement"
relatively small-scale tests carried out to date. required for an interoceanic canal have not yet been established. canal in the near future. cuts required by an interoceanic canal are so great that the present "Plowshare"
construction of a canal along Routes 17 or 25.
that could be used with assurance in the foreseeable future. for such an application has been proved unconditionally. or 25 is many years away. greater than estimated in 1964.
majority of the parties to the Treaty. for mutual cooperation in the employment of nuclear explosives for peaceful purposes. subject shall commence as soon as possible after the Treaty enters into force. benefits pursuant to bilateral agreements. Treaty remain to be initiated. be released to the environment would not be acceptable. magnitude among countries, but none appears easily overcome. from the Route 17 area could cause widespread Panamanian opposition to a Route 17 canal. area of nearly the same magnitude as for Route 17.
to slow development of the technology. precluded by economic developments in the vicinity. all-conventional sea-level canal construction elsewhere in Panama. Colombia cannot now be determined. canal required that the basic criteria of design and construction be the same for each route. *See Footnote on page 25.
additional locks, will be 26,800 transits per year. the opening of a sea-level canal that could accommodate ships of 150,000 DWT or greater. be unmanageable in an unrestricted canal under adverse tidal conditions. the Pacific at Balboa averages eight inches higher than in the Atlantic at Cristobal. substantially greater, because of its greater cross-sectional area. models in a confined channel. ships smaller than 50,000 DWT nor less than 5 knots for larger ships. than the velocity of the following current. control of all large ships and of small ships of limited maneuverability. Tug assistance is required for all large ships in the present canal and is expected to be similarly required in a sea-level canal. held to approximately 3 knots. the controllability of large ships in a sea-level canal. position would then be reversed 6.2 or 12.4 hours later. an artist's sketch of a tidal check structure at one end of the bypass in a sea-level canal. measure the lag in time with respect to the Pacific tides. it also would put a tidal check at the Atlantic end of a future bypass on Route 10.
and that this capacity could most economically be augmented by the addition of a bypass. double the width of a single-lane canal. it would permit passage of 250,000 DWT ships under controlled conditions. and a depth at the sides of 75 feet. tide as Convoy 1 is one-way channel. the slides along the Panama Canal have stemmed from this cause. the several routes, the recommended slope criteria. of construction methods is limited to conventional procedures. for unconsolidated deposits at moderate depths. remove the tops of hills. 4. Hydraulic dredges and pipeline disposal of unconsolidated sediments below water. where the fill would be most useful. Stream courses would be altered where they intersect a canal on any route. canal would be an added barrier. required the creation of Gatun Lake. on the receiving ocean's temperatures or currents are insignificant. been identified with these large landfills. the Pacific to the Atlantic, in excess of the sediments that would reach the oceans naturally. widespread competition and extinction of thousands of species. of those species which may manage to get through the canal. the very habitats that have been least thoroughly studied. characterize these habitats are imperfectly known and inadequately understood. between the tidal gates would be practicable, but the available supply of water is limited. of biota through the canal should have been determined. although its selection is considered unlikely. analysis of augmentation of the existing lock canal is also provided. capacity, expandability, political acceptability, and its defense aspects. the Panama Canal Company, is estimated to be 26,800 annual transits. This program. into Gatun Lake or recirculating lockage water. are briefly summarized. Details are in the Annexes to this report. Widening the Panama Canal channel from 300 feet to 500 feet was completed in 1970. Miraflores Locks and excavation for third locks at left. Pedro Miguel Lock and Gaillard Cut are in the background. The Panama Canal is now lighted throughout its length and operates around the clock. annual transit capacity criteria would cost much more. the reasons given in Chapter IV. remote from Panama's developed areas an essential requirement for nuclear excavation. portion of the total excavation volume) appear technically suitable for nuclear excavation. Route 10 or Route 14.
blockage by scuttled ships, making defense a less difficult problem than on other routes. operations away from the vicinity of the present canal. of seaward approach channels. This alone makes it non-competitive with other routes. 17 and its Caribbean terminus the same as for Route 25.
excavation wholly by conventional methods. with Colombia combine to eliminate this route from further consideration. the Atrato River would be accomplished by hydraulic dredging. economies promised by nuclear excavation. Truando River Valley, and the Saltos Highlands would be excavated by nuclear explosives. conventionally excavated reaches conventional dry excavation methods would be used. comparison with the costs of wider channels on other routes. time have no true significance. promising for Route 25 than for any other route. length is nearly three times that of routes in Panama, and all defense facilities buildings. required to provide a level of security acceptable to the United States. existing canal could be difficult and expensive. canal in Colombia would have changed and Route 25 would merit reconsideration. 92 feet above sea level. evaluation of sea-level canal alternatives. Table 15 summarizes its characteristics and costs. lock canal capable of transiting these carriers was given no further consideration. estimated to be about 25 hours. further traffic growth would not be practicable. or major revision of the present treaty willingly entered into by Panama. lock canal's current inability to transit the Navy's aircraft carriers would continue. already accomplished for the unfinished third locks project. wide and must be operated on a one-way basis for the largest ships that transit the canal. Cut widening and deepening would further limit capacity during the construction years. Three feasible design configurations for Route 14S have been considered (Figure 38). includes 1400 by 85 foot two-lane approach channels at both its Atlantic and Pacific ends. A 33 mile single-lane section. A 24 mile single-lane section. Two parallel 19 mile single-lane sections. of the tidal checks would vary with the configuration and the maximum acceptable current. discussed later in more detail. The initial transit capacity would be at least 35,000 annually. restricted section would significantly increase capacity. Si BLOOD I AtUA SAL, . would create the minimum local disturbances. levels, time lost would be significantly less. side of the sea-level canal across Gatun Lake. existing Panama Canal facilities in support of canal operations. A single-lane channel for the full length of 36 miles. located bypass section consisting of two single-lane channels. Two parallel 36 mile single-lane channels separated by a berm. bypass across the Isthmus, providing two parallel one-way channels. present canal and thereby permit excavation in the dry of the bulk of the material. Table 17 gives the capacity-cost data for the single lane configuration. this purpose and permit more than 35,000 transits per year. on Panamanian territory do not appear to be irreconcilable. I ASOR U- A -KHi PENINSULA . time in transit than a single-lane canal. canal to pass to Panamanian control and be operated in competition with the sea-level canal. One disadvantage of Route 10 is that it lies outside the existing Canal Zone. jurisdiction of the canal operating authority should affect all routes equally. Route 14 with its more extensive barrier dams needed to preserve Gatun Lake. of the choice of Route 10 or Route 14.
indicated, a potential annual transit capacity of 26,800 ships of all sizes below 65,000 DWT. the old canal permanently until the lack of ultimate need for it was certain. maintaining it on a non-operating standby status is estimated to cost $1 million a year. the trace of the existing canal (Route 14). excess of 100,000 annual transits. United States and Panama to ensure adequate canal capacity indefinitely. foreign exchange earnings for Panama. the channels and locks of the existing canal maintained for reactivation when needed. The defense advantages of a sea-level canal on Route 10 have been discussed above. forces could be augmented as necessary. the existing Panama Canal as a single system. canal. The costs of these operations taken together approximately equal their total revenues. Government functions, such as police and education, are financed from general revenues. a cost nor a source of revenue in sea-level canal operations. to Panama with royalty payments for each long ton of cargo transported through the canal. operating a sea-level canal in Panama. inflation of costs. All estimated costs and revenues, therefore, are stated in 1970 dollars.